The Kingdom Come: Deliverance is an AAA computer game developed by Warhorse Studios in Prague on top of CryEngine3. It is a large scale open world computer game with more than 400+ NPCs. AMIS researchers provided consulting on the decision making mechanisms for single NPCs and later developed key components of the NPC decision making architecture and key components for the environmental intelligence of the world. Researchers from AMIS now cooperate with the AI Team on further developing the mechanisms of area management and situational management. The group is intimately involved in the production deployement and development, since some AMIS researchers continue to work on the game as the AI development team. Czechoslovakia 38-89: Assassination is a complex educational simulation for high school students. Its educational objective is to present key events from Czechoslovakia’s contemporary history and to enable students to “experience” these events from different actors’ perspectives. In doing so, the simulation aims to develop deeper understanding of the multifaceted political, social and cultural aspects of this time period. The simulation’s content covers particularly the following topics: daily life in the Protectorate of Bohemia and Moravia, ghettoization of Czech Jewish citizens, resistance movement, collaboration with occupation regime, the Holocaust, the Romani genocide, retributions. The development of Czechoslovakia 38-89: Assassination was supported by the grant project DF11P01OVV030 “Stories from the History of Czechoslovakia: research and experimental development of educational simulations for teaching history of the Czech lands in the 20th century” financed by the Czech Ministry of Culture and investigated at the Faculty of Arts and Faculty of Mathematics and Physics of Charles University in Prague and the Institute of Contemporary History of the Academy of Sciences of the Czech Republic in 2011-2014. Czechoslovakia 38-89: Borderlands is a complex educational simulation for high school students. Its educational objective is to present key events from Czechoslovakia’s contemporary history and to enable students to “experience” these events from different actors’ perspectives. In doing so, the simulation aims to develop deeper understanding of the multifaceted political, social and cultural aspects of this time period. The simulation’s content covers particularly the following topics: post-war aftermath, expulsion of Germans from Czechoslovakia, rise of communism to power, Volyn Czechs, collectivization. The development of Czechoslovakia 38-89: Borderlands was supported by the grant project DF11P01OVV030 “Stories from the History of Czechoslovakia: research and experimental development of educational simulations for teaching history of the Czech lands in the 20th century” financed by the Czech Ministry of Culture and investigated at the Faculty of Arts and Faculty of Mathematics and Physics of Charles University in Prague and the Institute of Contemporary History of the Academy of Sciences of the Czech Republic in 2011-2014. Czechoslovakia 38-89: Escape is a complex educational simulation for high school students. Its educational objective is to present key events from Czechoslovakia’s contemporary history and to enable students to “experience” these events from different actors’ perspectives. In doing so, the simulation aims to develop deeper understanding of the multifaceted political, social and cultural aspects of this time period. The simulation’s content covers particularly the following topics: political persecution in 1950s Czechoslovakia, Prague Spring, Warsaw Pact invasion of Czechoslovakia in1968, normalization. The development of Czechoslovakia 38-89: Escape was supported by the grant project DF11P01OVV030 “Stories from the History of Czechoslovakia: research and experimental development of educational simulations for teaching history of the Czech lands in the 20th century” financed by the Czech Ministry of Culture and investigated at the Faculty of Arts and Faculty of Mathematics and Physics of Charles University in Prague and the Institute of Contemporary History of the Academy of Sciences of the Czech Republic in 2011-2014. Czechoslovakia 38-89: Encyclopedia is an educational application which presents students with factual information related to the content of the Czechoslovakia 38-89 simulations. The development of Czechoslovakia 38-89: Encyclopedia was supported by the grant project DF11P01OVV030 “Stories from the History of Czechoslovakia: research and experimental development of educational simulations for teaching history of the Czech lands in the 20th century” financed by the Czech Ministry of Culture and investigated at the Faculty of Arts and Faculty of Mathematics and Physics of Charles University in Prague and the Institute of Contemporary History of the Academy of Sciences of the Czech Republic in 2011-2014. The goal of this project is to investigate the acquisition of mental models under a high vs. a low state engagement condition. In particular, we research the question if a high state engagement can lead to better acquisition of mental models compared to a low state engagement. Three different interventions are used: a live action role playing game, an interactive educational simulation, and an animation. This project is the sequel to the LEES project. This work is supported by GA CR 15-14715S. ect of a particular simulation. A solid theoretical framework explaining how and why learners learn from ESs is lacking. This project proposes that students construct mental models of phenomena depicted by an ES better comparing to traditional instruction due to students' active exploration and increased engagement, and on a theoretical level, it connects this proposal to Mayer's theory of multimedia learning. The aim of this project is to investigate this hypothesis by longitudinal comparative studies combining qualitative and quantitative measures, including assessing salivary cortisol levels. This work was partially supported by GA CR P407/12/P152. During 2011 — 2013, development of several extensions needed for the course Human-like Artificial Agents taught at CU (i.e., a middleware for the purpose of this course) were supported by the project nr. CZ.2.17/3.1.00/33274 financed by the European Social Fund and Municipal House of Prague. The most notable extensions are: a new navigation module, visibility matrics computations, and the CTF modul. All of them are included in Pogamut v. 3.5.0. Research on action selection and planning using Pogamut is supported by P103/10/1287 (GACR, 2010 - 2014) and by a student grants GA UK No. 655012/2012/A-INF/MFF, 559813/2013/A-INF/MFF (2012 - 2013), 0449/2010/A-INF/MFF (2010 - 2012). In cooperation with University of Delft (people around and including Koen Hindriks), University of Bath, AmonI group, and Generation Europe Foundation. The purpose of this development project is to expand and establish university courses taught on the topic of computer-based educational simulations and computer games at our Faculty and at the Faculty of Arts, Charles University in Prague. Together, 8 courses were expanded or newly created. Supplementary software for our students has been developed. Projekt je financován Evropským sociálním fondem a rozpočtem hlavního města Prahy pod číslem CZ.2.17/3.1.00/33274. Do you want to create your own short movie in 3D virtual reality? In a large virtual town inhabited by 3D virtual humans, you can now make one! We use UT 2004 game and UDK as the 3D engines. Financially supported by the project CZ.2.17/3.1.00/ 31162 financed by the European Social Fund and the municipality of Prague (2010 - 2011). In cooperation with Generation Europe Foundation. The goal of this project was to develop an on-line multi-player strategy game aimed at education of high-school students in economics, politics, and media studies. During 2009 - 11, the game was implemented in several dozens of high-schools in the Czech Republic. Does the game really teach something? Yes! Are you interested in a high-school competition? In cooperation with Generation Europe CZ, Ciant, and Institute of Information Studies and Librarianship (Charles University in Prague). This work was supported the project Integration of IT Tools into Education of Humanities, which is financed by the European Social Fund, the state budget of the Czech Republic, and by the budget of Municipal House Prague. The goal of this project (Emohawk) is to develop a toolkit facilitating teaching how to build virtual characters. The target audience is high-school students. The project extends our Pogamut toolkit. In cooperation with Generation Europe CZ. This project is partially supported by the project CZ.2.17/3.1.00/31162, which is financed by European Social Fund. This tool visualizes steering techniques proposed by Craig Reynolds with virtual characters in the emohawk virtual town. We have made several improvements that increase the performance of steerings for virtual characters in the terms of believability. A user can specify which steerings should be used by a character and their parameters and then see the result in the 3D simulation. This work is partially supported by GA CR P103/10/1287. The software prototype MIVE (Multiuser Interactive Virtual Environment) is a middleware tool for creating educational simulations based on the principles of game-based learning. MIVE Version 1.0 has been developed at the Faculty of Arts and the Faculty of Mathematics and Physics of the Charles University in Prague in 2012. MIVE is designed as a universal component enabling further expansion by additional modules. MIVE particularly facilitates (a) presentation of key historic events to students from the perspectives of various actors, (b) integration of archived materials including multimedia and (c) collaboration between individual users. The MIVE platform is currently used in a project as a tool for development of historical educational simulations. The development of MIVE has been supported by the grant project DF11P01OVV030 “Stories from the History of Czechoslovakia: research and experimental development of educational simulations for teaching history of the Czech lands in the 20th century” financed by the Czech Ministry of Culture and investigated at the Faculty of Arts and Faculty of Mathematics and Physics of Charles University in Prague and the Institute of Contemporary History of the Academy of Sciences of the Czech Republic in 2011-2014. The MIVE Debugger is a debugging tool used to test and debug educational simulations and games developed by using the MIVE (Multiuser Interactive Virtual Environment) platform. It features testing-mode that auto-cap movies, animations and tweens thus speeding the debugging. It also tracks the sequence of scenes loaded by the engine and dialog options chosen by the user allowing her to "go back", i.e., revert the game state, to a certain point in the past sparing the user of necessity to restart the debugger in order to observe the same bug multiple times. It also displays a handful data like values of variables, currently running scene, memory consumption and highlights borders of respective screen objects and the event log. MIVE Debugger Version 1.0 has been developed at the Faculty of Arts and the Faculty of Mathematics and Physics of the Charles University in Prague in 2013. The MIVE Debugger is currently used in a project as a tool for development of historical educational simulations. The development of MIVE Debugger has been supported by the grant project DF11P01OVV030 “Stories from the History of Czechoslovakia: research and experimental development of educational simulations for teaching history of the Czech lands in the 20th century” financed by the Czech Ministry of Culture and investigated at the Faculty of Arts and Faculty of Mathematics and Physics of Charles University in Prague and the Institute of Contemporary History of the Academy of Sciences of the Czech Republic in 2011-2014. This research project addresses the problem of integrating AI planning with execution of plans for intelligent virtual agents. In particular, the project attempts to answer the questions such as how the planning domains and goals can be automatically extracted from 3D environment descriptions and agent intentions, how the planned actions can be translated back to actuators, how planning and execution of plans is coordinated, and what type of planning algorithms is the most appropriate for autonomous agents. 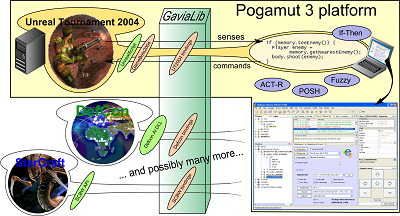 Integral part of the project is also development of the platform, extending Pogamut, for experiments with virtual agents that have planning capabilities (not only reactive behavior) and development of new planning techniques. In cooperation with a lab led by Roman Bartak. This work is supported by GA CR P103/10/1287. The goal of this project is to develop a human-like agent with some episodic and spatial memory abilities. Generally, the model is both partly grounded in behavioral data and embodied in an acting virtual character, increasing its believability. The model integrates five parts: a memory for events, a component reconstructing the time when an event happened, a topographical memory, and an allocentric and egocentric representations of locations of objects. Its main functional features include: detail representation of complex events (e.g. cooking a dinner) over long intervals (days) in large environments (house), forgetting, and development of search strategies for objects in the environment. This work is partially supported by the Ministry of Education of the Czech Republic (grant MSM0021620838) (2008-11), and by the Program "Information Society" under project 1ET100300517 (2006-9). 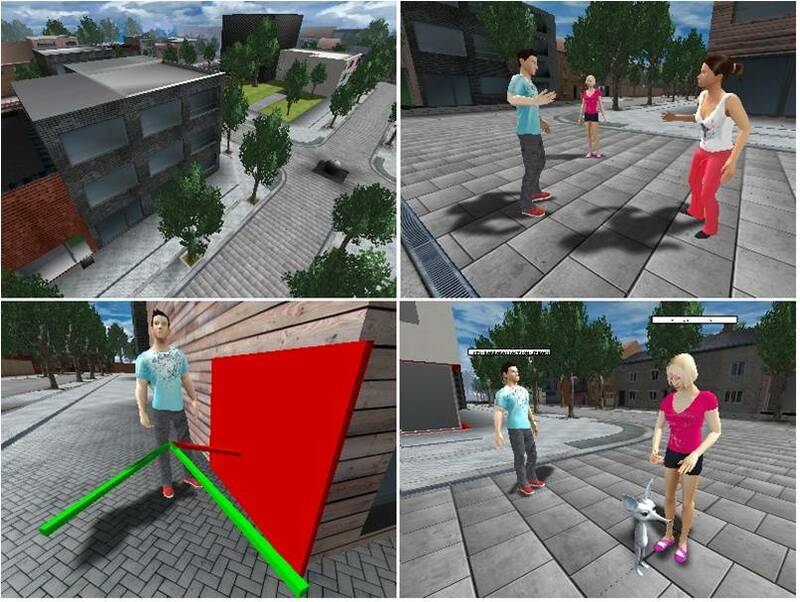 This project concerned with modelling behaviour of virtual humans acting in virtual environments large in size and complexity of behavioural possibilities. Namely, we exploited the concept of virtual affordances and investigated the level of detail technique at the level of behaviour and space (as opposed to its use in computer graphics). The version 1.1 of IVE has been completed in April 2006. Would you believe that we have a book chapter in Game Programming Gems 8 about LOD in IVE? This work was supported by the Ministry of Education of the Czech Republic (grant MSM0021620838), and by the Program "Information Society" under project 1ET100300517, and GA UK 351/2006/A-INF/MFF.